(Newser) – Mitt Romney is preparing to announce a bid for the Utah Senate seat held by retiring Orrin Hatch, a position some hope the 2012 GOP presidential nominee will use to continue his biting criticism of President Trump. Romney, who once called Trump "a phony" who was unfit for office, is not expected to address the president in an announcement video he has prepared for release online, sources tell the AP. Romney had planned to release the video on Thursday, the insiders say, but he tweeted Wednesday night that he would not make an announcement about Utah's Senate race because of the deadly school shooting in Florida. It wasn't clear when he would reschedule his announcement. Former Rep. Jason Chaffetz, a Utah Republican who resigned last summer, said Romney's clashes with Trump won't hurt him with Utah voters but that "I do think people want to know he's running not just to be an agitator to the president. I don't think that's going to win the hearts and minds, but I also don't think he's going to do that," Chaffetz said. "Mitt Romney's always been diplomatic. It's why Donald Trump almost named him the secretary of state. He's very deliberate and smart in what he does." 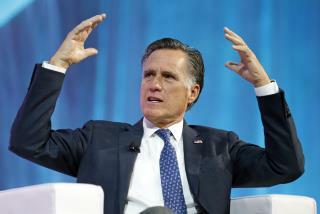 Romney isn't expected to face any serious challenges for the seat, though some see him as an outsider. Utah Republican Party Chairman Rob Anderson told the Salt Lake Tribune that Romney is "keeping out candidates that I think would be a better fit for Utah because, let's face it, Mitt Romney doesn't live here, his kids weren't born here, he doesn't shop here." Come On ... we need some comic relief. Mitt Mitt he is the man, if he cant do it someone else can. Another ego maniac on the move. Why don't wealthy white men over 70 just move on, and do volunteer work?